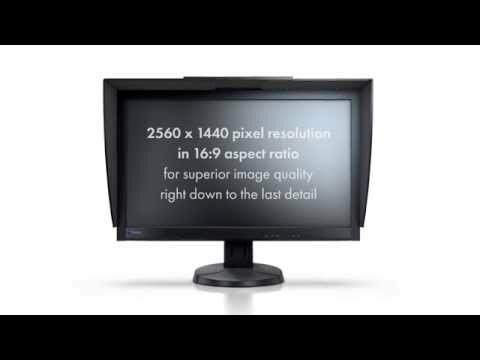 Product Overview The new ColorEdge CG277 monitor from Eizo is built to deliver optimal performance. Achieving 99% Adobe RGB colour space coverage, a 10-bit simultaneous display and hardware calibration, the ColorEdge CG277 is a self-calibrating monitor for professionals in photography, printing and post production. • Built- in SelfCalibration Sensor – Automate your calibration with the built-in SelfCalibration sensor. Housed within the monitor’s bottom bezel, the sensor only swings up onto the screen when it is calibrating. The SelfCalibration sensor is ideal for both portrait and landscape modes, and eliminates the need for a third-party calibration device. The monitor can be scheduled to self-calibrate at specific times even when the monitor is switched off or not connected to the computer. • Correlation with external sensors – If you prefer to use an external monitor calibrator, the CG277 can correlate to the measurement characteristics of your external calibrator. This is convenient for those who prefer to use a standard calibrator throughout their work environment. • Reproduces 99% of the Adobe RGB Colour Space – The IPS panel of the CG277 has a wide colour gamut which reproduces 99% of the Adobe RGB colour space. Images shot in RAW can be converted to Adobe RGB, or images shot in Adobe RGB will be displayed correctly. Whether it’s a vibrant sky or a lush green forest, images will be reproduced faithfully. The wide colour gamut ensures that the monitor reproduces almost the complete ISO-coated and US web-coated CMYK colour spaces used in printing, as well as 93% of the DCI used in post-production. • Excellent tone display in the dark – In dimly lit spaces, dark tones can appear washed out due to the display characteristics of LCD backlights. The CG277 maintains a high contrast ratio, even at angles, allowing dark tones to retain their depth. • Non-Glare IPS panel – The In-Plane switching panel exhibits no glare, so several people can view the monitor with minimal colour shift. • LED Backlight Cuts Power by 40% - The LED backlight reduces energy consumption by 40% compared to a conventional backlight. It is also mercury-free for less impact on the environment when it is eventually disposed of. • Brightness Modulation Minimises Flicker - To counteract the flicker that is noticeable by some users at low brightness settings, Eizo uses PWM (pulse width modulation) technology. This helps prevent eye fatigue for a more comfortable work environment. • Uniformity from Corner to Corner – Commonly on LCD monitors, there can be fluctuations in brightness and chromaticity on different parts of the screen. To prevent this, the CG277 uses Eizo’s patented digital uniformity equaliser (DUE) to ensure a Delta-E difference of 3 or less across the screen when the monitor leaves the factory. It also counterbalances the influences that a fluctuating ambient temperature may have on colour temperature and brightness, ensuring a stable image display. Features • 10-Bit simultaneous display – can show more than one billion colours simultaneously. • Preset colour modes – Rec. 709, EBU, SMPTE-C and DCI. sRGB and Adobe RGB modes are also available. • Input support for 4K x 2K – resolutions of 4096 x 2160 and 3840 x 2160 at up to 30fps using the DisplayPort input.